Ecuador has one of the highest deforestation rates in South America. Between 1990 and 2015, the country’s forest cover was lost at an annual rate of about 0.6%, due to expansion of agriculture, oil exploration, logging, mining as well as insecure land tenure, and weak public institutions. Illegal and informal timber harvesting is widespread throughout the country. 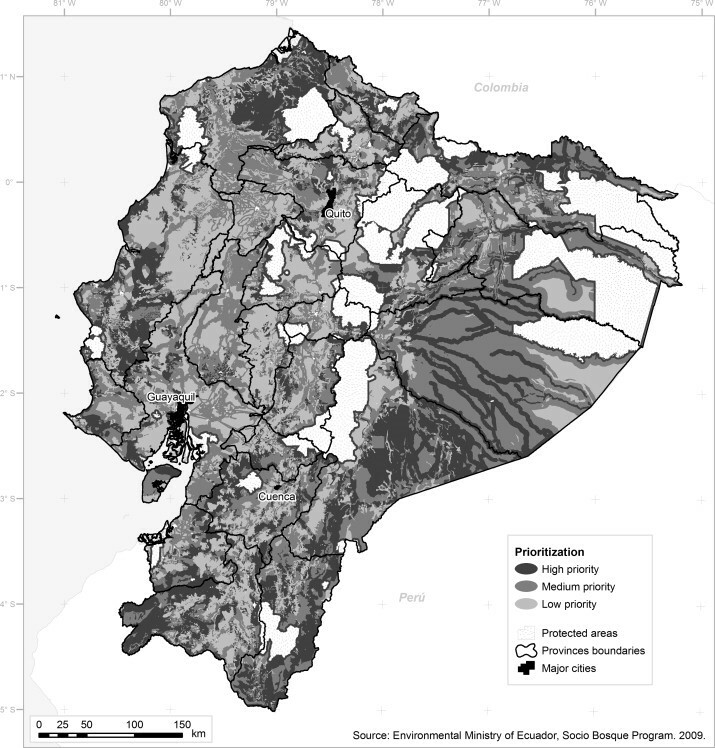 Furthermore, Ecuador is highly vulnerable to climate change, due to its economic reliance on resources that are affected by climate change, especially in its high-altitude ecosystems (including forests). Forest resources are especially important for those living in rural areas, many of whom rely on these resources for their livelihoods. Conserve native forests and other native ecosystems to protect their ecological, economic, cultural and spiritual values. Significantly reduce deforestation and associated GHG emissions. The Socio Bosque Program that began in Sept 2008 is an initiative of the Ministry of the Environment of Ecuador (MAE) that offers economic incentives to owners of land with native forests to guarantee its protection over the medium to long-term; to date, conservation agreements have been signed for 630,000 hectares. The Program gives priority to areas with a rapid dynamic of land use change, areas that are critical for the maintenance of ecosystem processes that generate benefits for society and areas with a high incidence of poverty. Increase quality and quantity of green infrastructures. Improve connectivity and functionality of green infrastructures. Increase infiltration / Water storage. Government giving initiatives to their citizens to be engaged in afforestation can be applied to all countries where the climate is suitable and the soil fertile to preserve and expand the floral environment. One of the main things that needs to be considered is the market of the target country and its economy can benefit from these actions in order to be sustainable and not injurious e.g. in this case study the produced wood is a main resource for the people of Ecuador as they rely a big portion of their livelihood in it. Conservation actions must be coupled with income in order to generate activities for long-term sustainability.